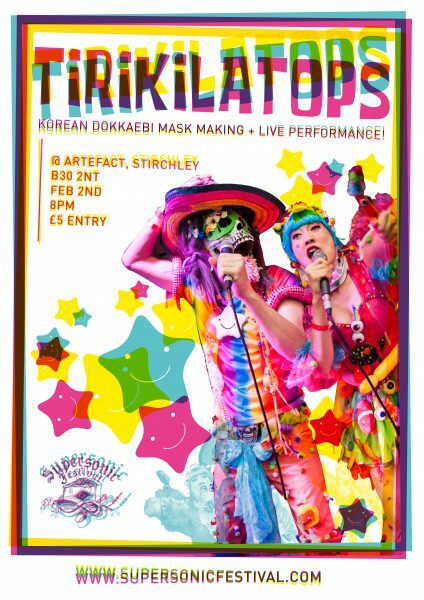 Come along for an hour or so of mask making over a lovely glass of vino, some local craft beers or a wonderful selection of teas & coffees, then finish it all off with a boogie to some Kimchi beats. Why not ey?! Tirikilatops are an avant-garde, cross-cultural, collaborative effort between UK and South Korean artists/musicians. Together they forge bizarre electro k-pop from an ingredients list that contains kimchi beats, pop sensibilities, offbeat lyrics, hacked keyboards and super earworm melodies. Their guiding forces are surrealism, dada, forteana and charity shop finds.